Hidden spy cameras are also called "spy cams" or "nanny cams" they are mini cameras that are housed inside a product design making the camera lens undetectable. They can be attached to a shirt pocket or house plant, left stationary on top of a desk or placed night stand. Spy cams were even employed for surveillance purposes after the Sept 11th attack when terrorist struck the world trade center in New York resulting in the loss of over 2000 lives. You can find hidden cameras employed in many public places such are railway terminals, shopping malls, airport or any other public place where the activities of people are closely monitored. In most cases, hidden spy cameras are used as a criminal deterrent and crime prevention. Hidden cameras has been used by home owners to secure their valuable from intruders; since the cameras are not easily visible activities around the home can be watched without anyone noticing. If you have a nanny or baby sitter, you can use this types of camera to monitor them after leaving your family member and home in their care. The development of wifi signals and remote access has made it possible for home owners to monitor activities from their office or any location with an internet connection. Hidden camera are either produced to operate with wires or without wires (wireless). Wireless ones like spy pens, clothes hook cameras and hidden camera smoke detectors and picture frames operate with batteries while the wired spy cameras are hand wire and must be connected to a power source to work. In the event of a power outage a wireless hidden camera will continue functioning; this is the advantage it has over the wired one. Most wireless spy cams are charged using a USB outlet and run of a rechargeable battery. Operating times vary depending on the spy cam. Also, most are multifunctional, meaning it does more than record video. Many mounted and wearable spy cams also take photos and can create audio only recording. There are laws governing the use of spy cameras, in some places they are completely banned or against the law, unless when granted permission. Before purchasing one, it is good to understand the rules and regulations regarding the use of any hidden camera or spy cam devices for surveillance purposes. Know that ignorance is not an excusable defense when breaking the law. Spy cameras can be a worthwhile investment for those that own small business because you will be able to monitor your establishment when you are not there and it will give you peace of mind. 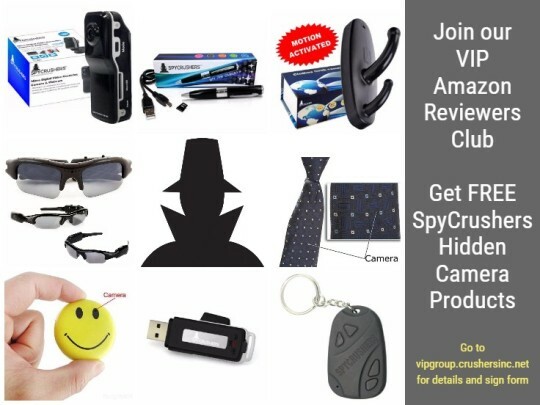 SpyCrushers has some unique spy camera to take a look at if you are looking for one that looks like one thing but performs like a video recorder. There are 1080p spy pen cameras that can identify activities inside your bedroom or office; another is the clothes hook camera that can record employees that try to steal and their hidden camera smoke detector is another effective spy camera that is installed on the ceiling. For keeping a continuous watch on the activities at your home or office, your best option is to have an all-inclusive spy camera. Spy cameras aid in obtaining vital information that would not be had otherwise. Recapping, know the law in your area before buying and choose a spy cam best suited for your particular circumstance. You find a bruise on your child or they have been dropping hints that their nanny or babysitter is causing them harm. What should you? If you suspect that your child’s life is in danger, take action immediately. This should involve firing your nanny or babysitter. Next, talk to your child. Children old enough to explain abuse will, as long as they know it is wrong. If you just have a nagging feeling, but no proof, you can spy on your nanny or babysitter. You can use a number of spy gadgets. What are they? A nanny camera. Hidden cameras marketed as nanny cams are just like traditional hidden cameras. The difference is they tend to have a kid’s theme. Since the individual in question is babysitting, no suspicion is aroused. It is common to find nanny cams inside baby monitors, stuffed animals, picture frames, clothes hook camera, clocks, and pillows. Most nanny cams record to a built-in hard drives, external micro sd cards while others are equipped with wifi remote viewing. A remote accessed webcam. Do you have a computer placed in the room that your child spends most of their time in? If so, use a webcam that can be accessed and viewed from a remote location. Many modern webcams now have these features. For that reason, check your computer’s camera before buying new. Even if your nanny spends time with your child in other rooms there are still benefits to using this device. It should be able to pick-up audio, especially screaming from a nearby room. Hidden audio recorders. Hidden audio recorders also come in a number of formats. They can be installed in most household devices, such as air fresheners, stuffed animals, and pens and usb flash drives. If you have the money, buy the above mentioned nanny cam. Most provide users with both video and sound. A cheaper alternative is to use a baby monitor. You are not home to listen, but hide a micro digital video recorder near the baby monitor. Your nanny will think nothing of seeing a baby monitor on the table, after all, you are a parent. However, what they will not know is that there is also a video recording device nearby. In addition to using the above mentioned devices, there are other steps you can take to spy on a nanny or babysitter. One of those involves coming home early. Your babysitter knows you arrive home each afternoon at 6:00pm. Leave work early and arrive home unexpectantly at 5pm. Access the situation. What was your nanny or babysitter doing? Was she near your child? Is your child in distress? If you cannot leave work early, enlist the help of a friend or family member. In fact, this also allows you to test your provider’s ability to care for your child. Did they let a stranger inside the house? When using spy gadgets to spy on a nanny or babysitter, always consider state laws. Usually, there are exceptions for nanny cams, especially if you suspect danger. Moreover, if your child is cared for in your home, it is your personal right to install a camera or audio recorder. Do avoid private areas like the bathroom. In their own home, your paid provider has the right to expect privacy, but not on the job and in yours. In short, if you know your babysitter or nanny is causing your child harm, take action immediately. Do not wait until you get proof on camera. If you just have that nagging feeling use some of the above mentioned tools. They always say a mother’s first instinct is right. You usually only hear about spy cameras being used in the movies. However, in the real world they are used for good and bad purposes. When they are used for security they can help catch criminals. There are people who will use spy cameras for their own selfish and bad reasons that are illegal. Let me explain what I mean. There have been many options available through the times for protecting society from people who are breaking the law. However, with the proliferation of computers, complex political and social systems and industrialization there is a greater need for a heightened level of security. The police and military will continue to protect us from the criminals and terrorists of the world. However, there are also individuals that use other security services and private investigators to conduct their own investigations and to protect their families, properties and businesses. They use modern surveillance to help them protect what they feel strongly about. You will continue to see more and more houses that are equipped with spy cameras so that the families that live there can continue to be safe and to warn them of suspicious individuals. Spy cameras have become a more frequent method to use when you are trying to protect your home or business. These cameras are also known as a hidden spy camera, wireless spy camera or a wireless mini spy camera. These cameras are very small and can’t usually be detected unless you know that they are there. The police and private investigators use them to help provide them with valuable leads and information that will help them catch the people who are breaking the law. They are also used to provide the courts with hard and accurate evidence against the criminals. The video from a spy camera doesn’t lie and thus they are relied upon to help get criminals convicted. They are also great for helping to alarm us of robberies and crimes before they are actually committed. Most of the time these cameras are used in places that require a lot of security to protect their businesses and the customers of their business. Some of these places are banks, casinos, airports (to spot any crimes of terrorism), military facilities and even ATM’s. These are just a few of the places that they are used. They are also used in private homes to protect children and the elderly citizens. People like to know that their loved ones are being protected and not abused. So they use a spy camera to help them determine that everything is as it should be in their homes. These cameras are also called nanny spy cameras, digital spy cameras, pinhole spy cameras and wearable spy cameras. To name a few popular products would include a spy pen, the clothes hook spy camera, a car keychain spy camera and clock alarm spy camera. There are people however that will use them for blackmail and prostitution. These are the people who are using them for illegal purposes. They are the ones that the police are trying to protect society against. You want to make sure that you know what spy cameras are being used for and make sure that you don’t use them illegally. It is always a good idea to talk to a lawyer to find out what the laws are concerning these types of cameras. Amazon product reviews for our most popular hidden camera and spy camera devices.